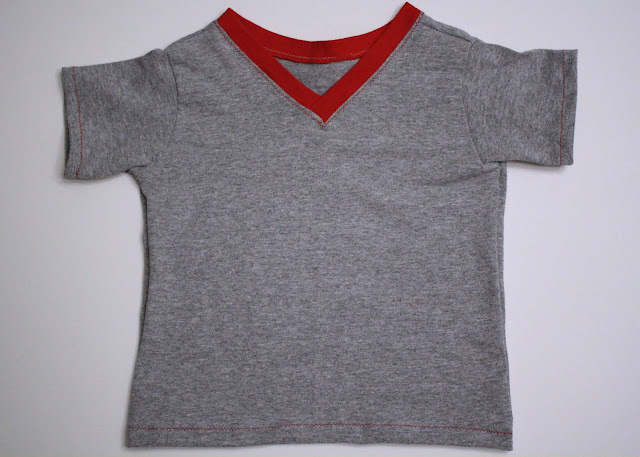 In this tutorial I’m going to show you how to alter a regular t-shirt pattern to make a v-neck (really easy) and I’ll show you how I actually sew the v in the neck binding. 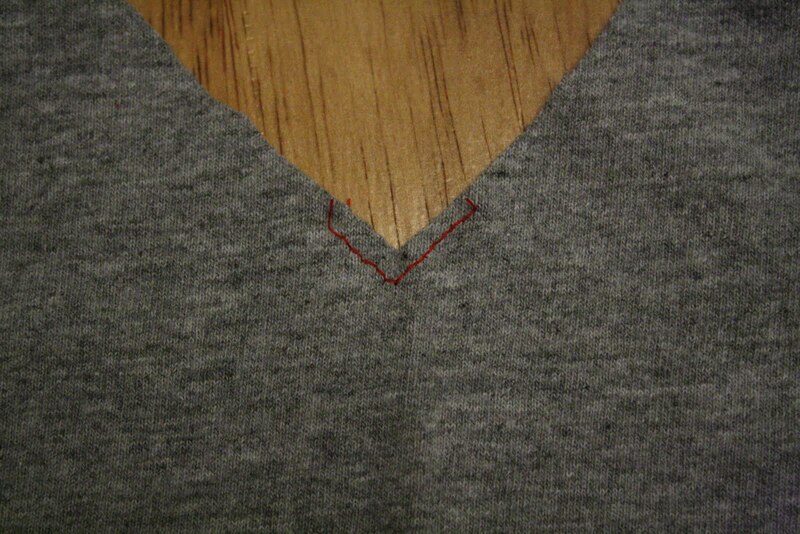 OK, one of the really easy things about making a v-neck is that you only have to alter the front pattern piece. 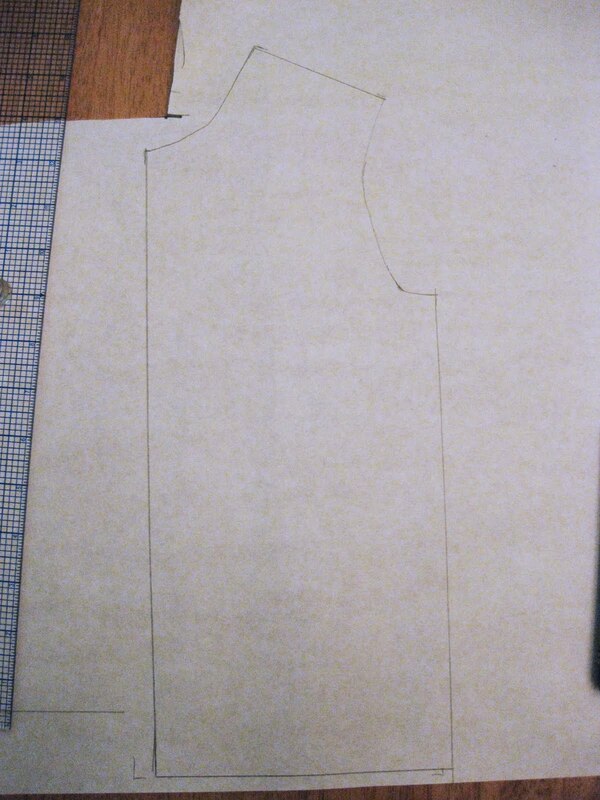 So trace out just the front on paper (or don’t cut out the one you just made). Next, determine how low you want the v. Since this is for a baby, and a boy, I’m not going very low. 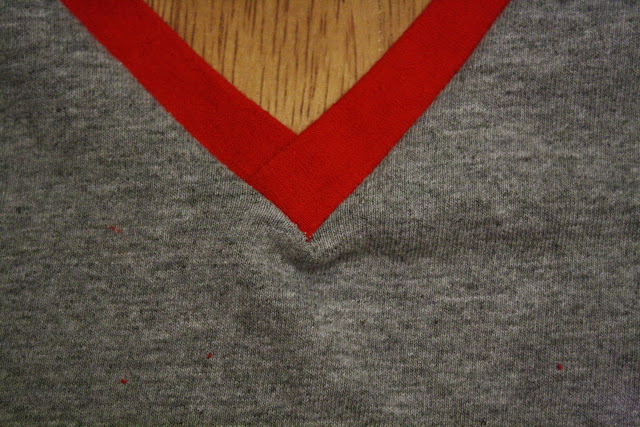 The red arrow in the picture below shows where the seam for the crew neck was. As you can see, I’ve chosen to go only a little lower with the v, about 3/4″. From that point, angle your ruler up to about 1/2″ below the point of the shoulder seam and draw a line. Now you need to add a seam allowance, so go 1/2″ above your seam line and draw another line. Make sure this line meets the point of the shoulder, this way you won’t have to redraw your back pattern piece, you can just use the same one from the crew neck. 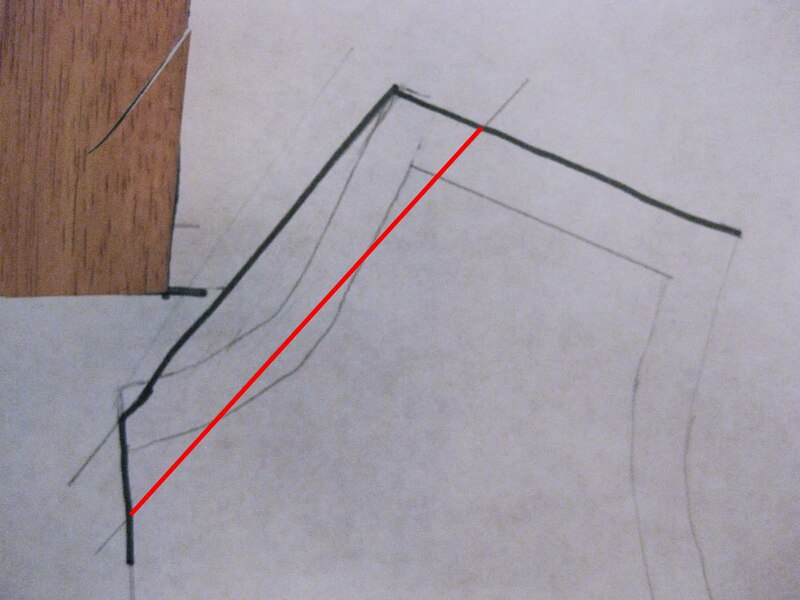 If you have to fudge the angle a little or go more than 1/2″ from your original line, do it, the most important thing is that you meet the shoulder point. 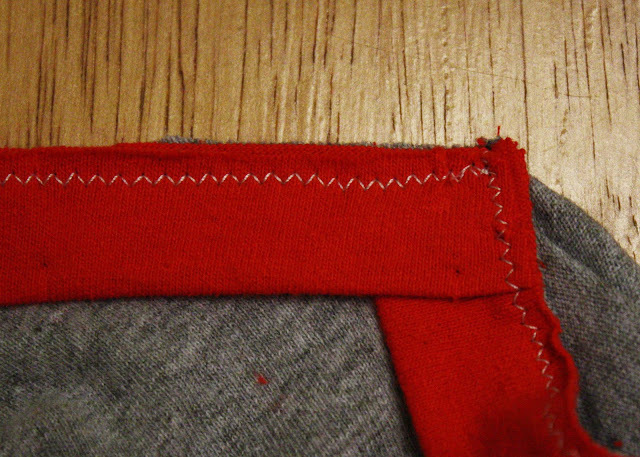 In the picture below the red line is my original one, and the black includes the seam allowance. You can see they’re not perfectly parallel. In this picture you can see the newly outlined pattern piece. Save this piece together with your crew neck variation, so you always have whichever neck you want to attach to your t-shirt back. 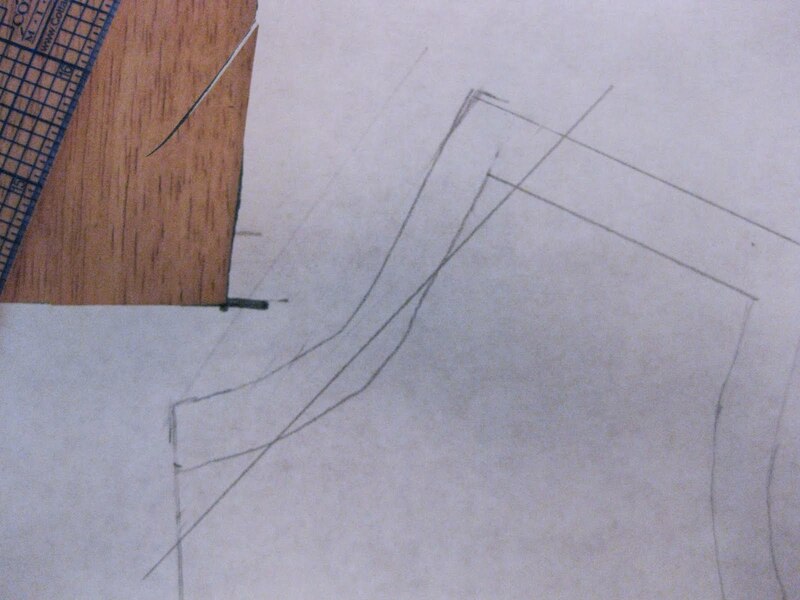 Now, how do you actually make the V binding to sew in? 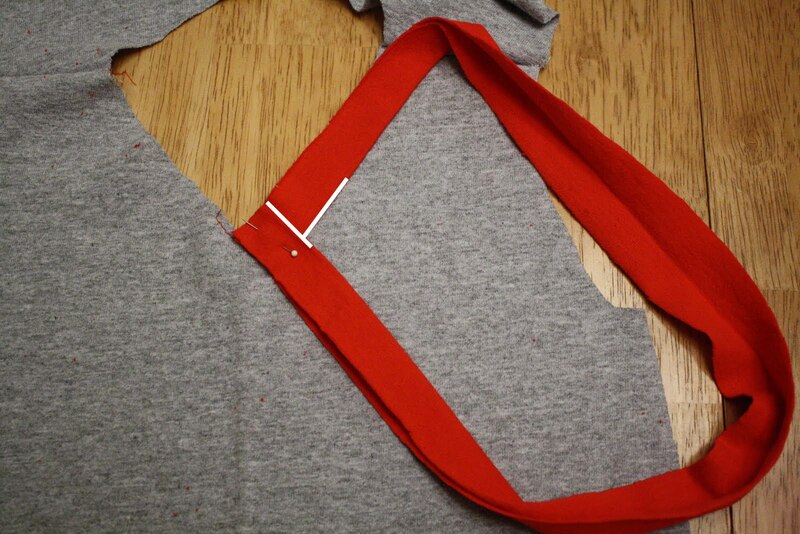 First, cut out your t-shirt and sew or serge the shoulder seams. 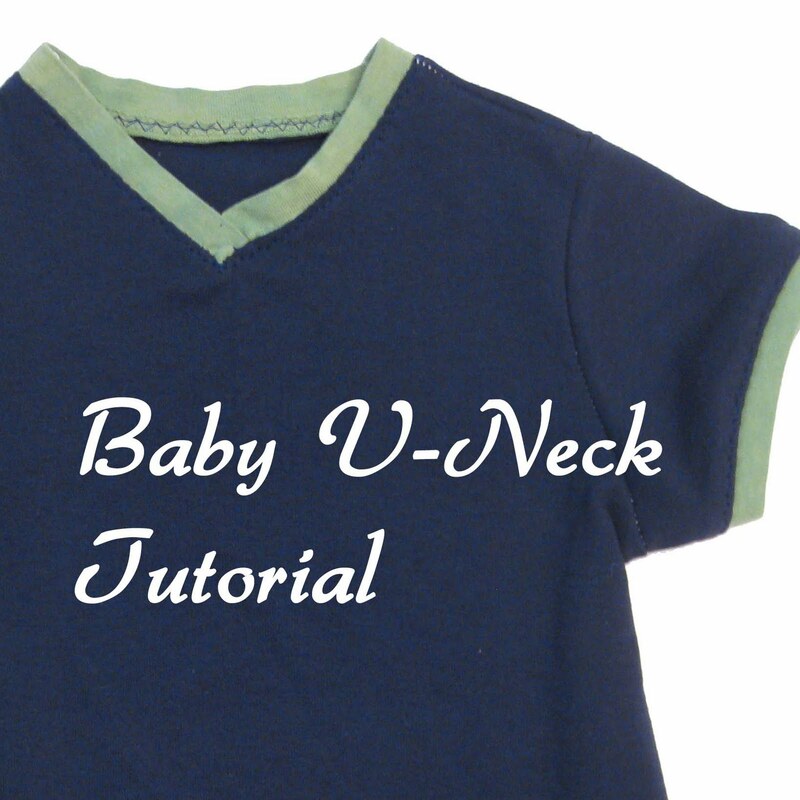 Now you need to measure around the neckline. Subtract about 1/2″-1″ depending on whether you are using regular interlock or rib knit for the binding; you don’t want to have to stretch the binding much for this kind of neck. I’m using regular interlock here, so I subtracted 1/2″ and then cut a strip of fabric that length and 1 1/2″ wide, making sure this strip stretches long ways. 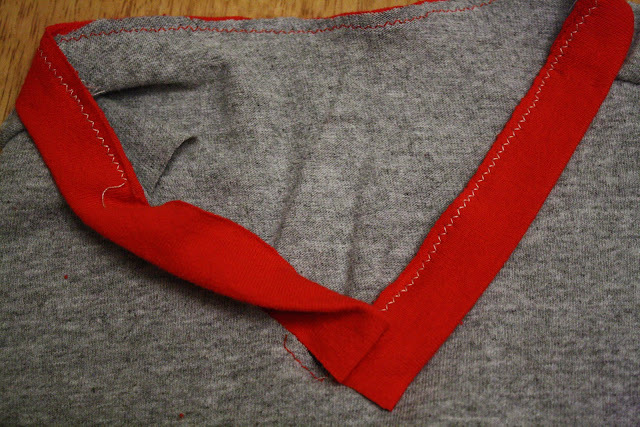 Fold the strip in half, right sides out, matching the long sides, and press flat. Hint: if you’re working with jersey, one way to tell the “right” side of the fabric is that the raw edges will curl toward the right side. 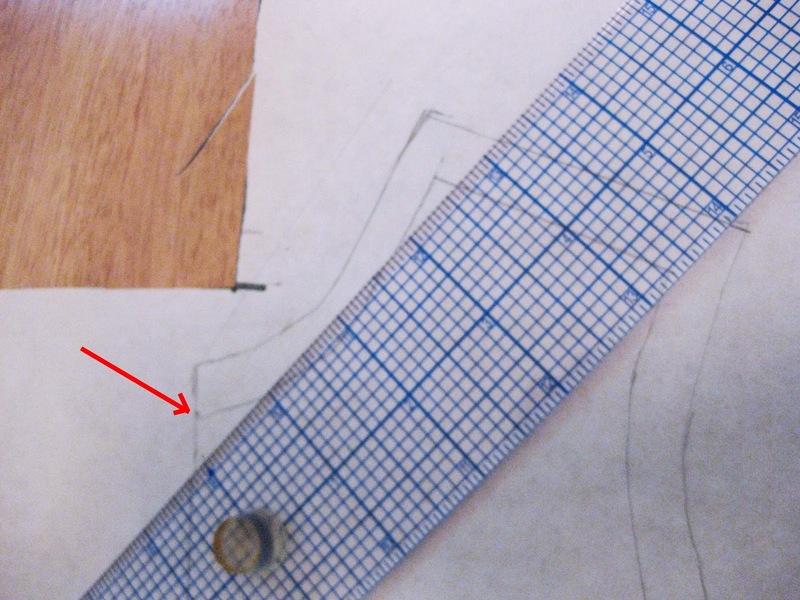 I’m going to use about 1/4″ seams, so that will leave me 1/2″ sticking out of the collar. Next, stay stitch the V of the shirt like this, about 1/8″ from the edge and about 1/2″ up each side. Pivot the shirt with your needle down when you come to the point of the V. Don’t stretch when you stitch, and use a straight stitch. You don’t want this part of your shirt stretching. 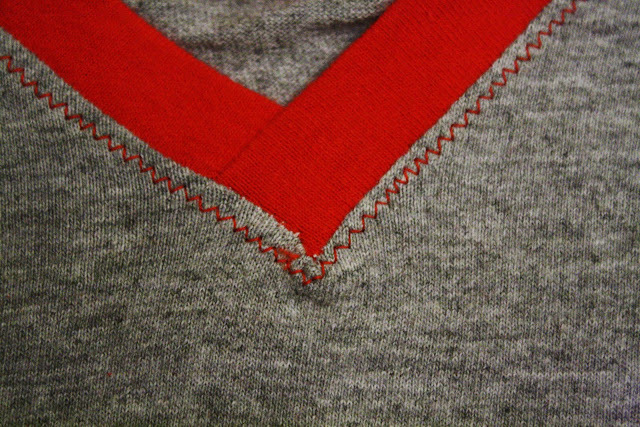 Next, overlap the edges of your binding and line them up precisely with the right side of the V with the shirt right side up. In the picture below, the white lines I added show the folded edges of the binding. You want the raw edges of the binding to line up with the raw edge of the neck. The bottom part of the binding in the picture is on top. 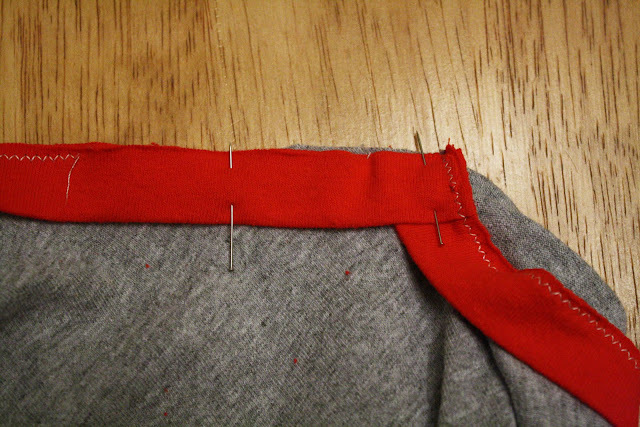 Make sure you have pinned very carefully so you don’t have any wrinkles at the V. If you do, stretch your binding gently as you pin to make sure there won’t be wrinkles when the needle gets to the V. If your stay stitching wasn’t pretty close to the edge, it can also help to snip the center of the V just to (not through!) your stay stitch line. Sew from where you left off stitching just until you hit the stitching line where you began sewing the binding on. DO NOT OVERLAP, this will cause puckering in the V.
See the little pucker I have? 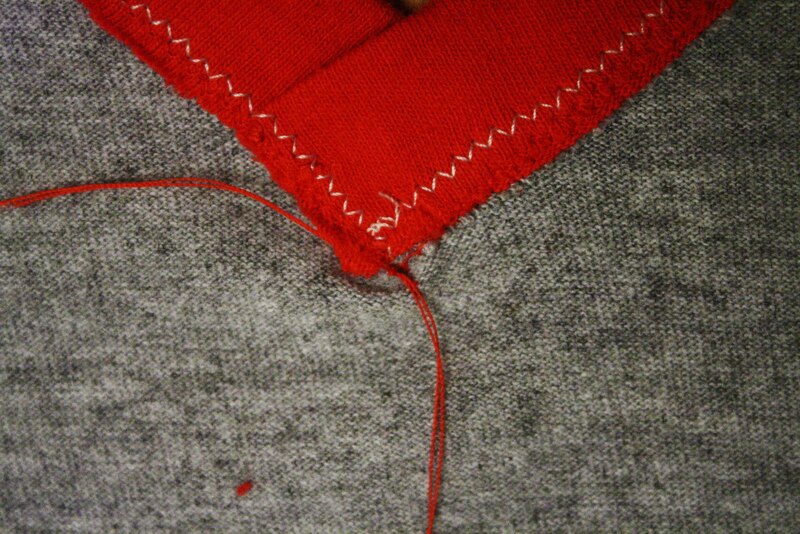 As long as you don’t have wrinkles on the V seam, this can usually be fixed with a little steam ironing. Check that it can before you continue. 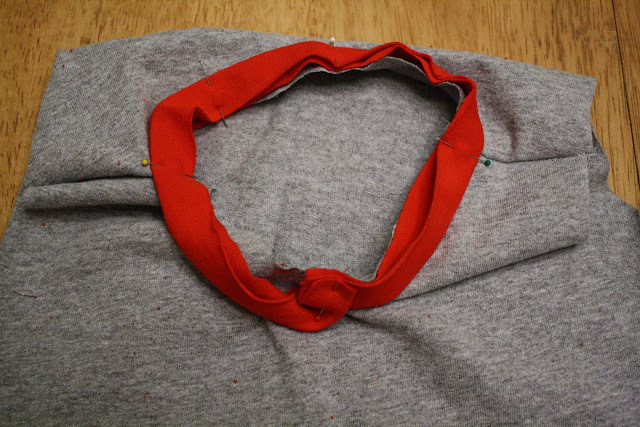 Because this can be a high stress area and I don’t want to see a backtack here, I pull my threads to the inside of the shirt and tie them off before cutting. Thank you for this! 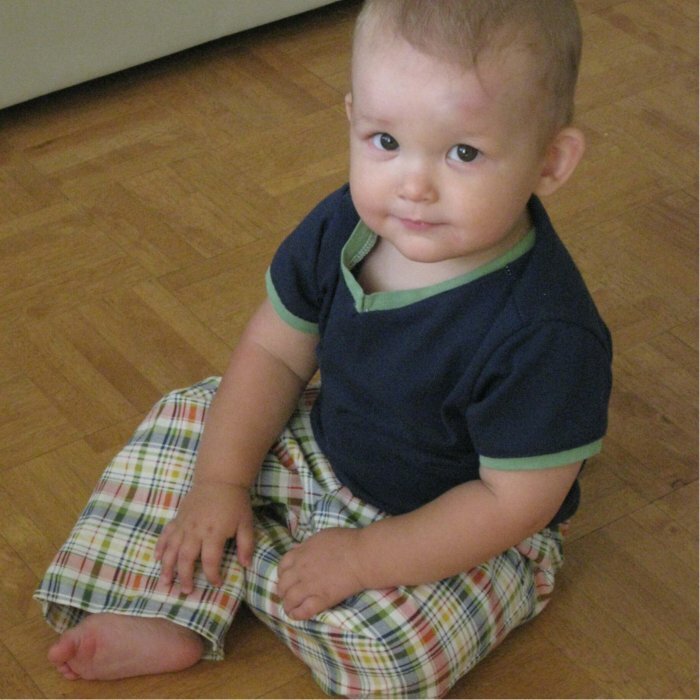 I just found it as I was preparing to make a Vneck for my litle guy. Thanks for the really clear tutorial, I successfully adapted a crew neck t shirt to v neck for my 7 year old from this.